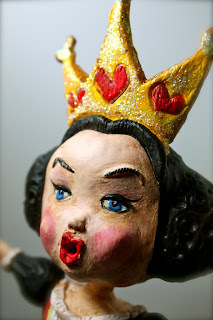 Strawberry Road: Queen of Hearts Paper Clay Doll FINALLY PAINTED!!! Oh Buttercup she is AWESOME! I was just thinking yesterday about whether you had finished her...weird!!! I have taken two classes with Jenny now and I am just loving it. We made Little Red yesterday, guess that is why I was thinking of you. And I just finished my bunny this morning hopefully I will have pictures soon in the next day or two. Thanks for the inspiration and good luck with the accent.